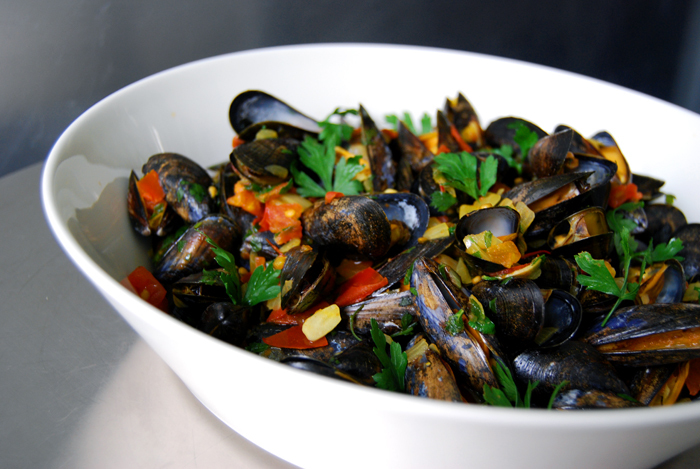 When I have mussels on my cooker I like to add spices, herbs and chopped vegetables, lots of flavours to enrich the broth they’re cooking in. I love to dip a piece of fresh baguette into the concentrated juice of wine cooked with mussels, garlic and parsley as much as I like the tender flesh. 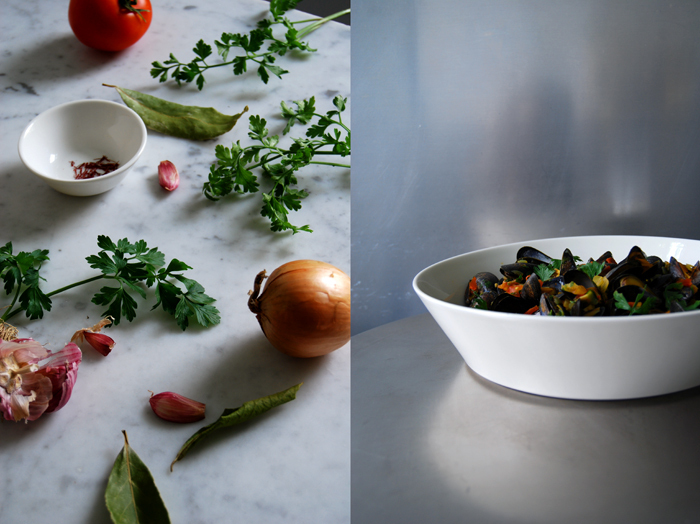 The last time I wrote about a recipe with mussels, it was an aromatic bomb inspired by my friend Essa’s kitchen. The list of spices was long with turmeric, coriander, fresh and seeds, cayenne pepper, ginger and lemongrass. Not too long after I shared this recipe, Marilena from the Molise region in Italy got in touch with me as she holds a completely different position when it comes to cooking mussels and seafood in general. Pure without too many distractions, that’s how it should be cooked in her opinion. I understand her point, and agree partly. I prefer prawn and lobster dishes that focus mainly on the seafood. When it comes to grilled steak fish, I feel the same. That’s also one of the reasons why my fish recipes in Malta were quite minimal. Although mussels have a very fine taste of the sea, almost sweet, I find they work very well in combination with exotic aromas. We all have our cooking preferences, our likes and dislikes which makes the product of each kitchen so unique! 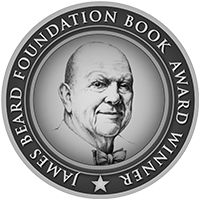 When it comes to baking, Marilena and I found common ground again. She asked me to bake her Milk Pan di Campobasso, a traditional dolci of the region where she lives. This cake is packed with saffron and Strega (an old Italian saffron liqueur) infused milk and covered with hazelnut icing. I had never heard of this combination before but since then I’m in love with saffron combined with nuts! 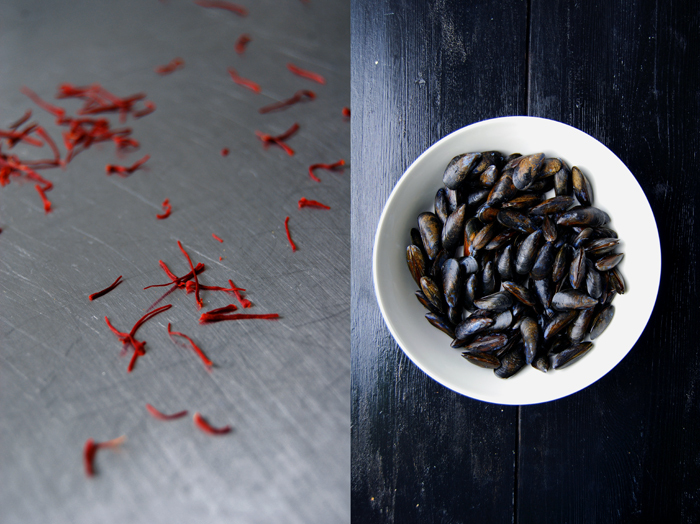 Today’s recipe for my mussels also works with the strong aroma of this precious, red spice. I felt like a strong broth with a dominant note of saffron mixed with tomatoes, bay leaf, parsley, onions and garlic. 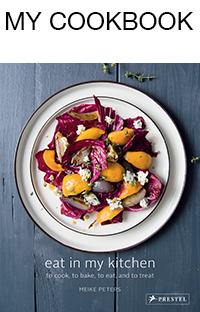 The dish looked and tasted like autumn! Warm flavours and colours, red, yellow and green on the shimmering Moules de Bouchot from the Mont-Saint-Michel bay between Brittany and Normandy. The mussels grow on ropes in the sea and that’s the taste they bring to the plate, the fresh sea! In a large pot, heat a splash of olive oil and cook the onion and garlic on a medium heat for a few minutes until soft and golden. Add the tomatoes, bay leaf, wine, saffron, salt, pepper and the mussels. Shake the pot gently to mix or stir with a slotted ladle. Bring to the boil, close with a lid and cook on lowest heat for 5 minutes or until the shells open (shake the pot once or twice while cooking). Discard any mussels that didn’t open! 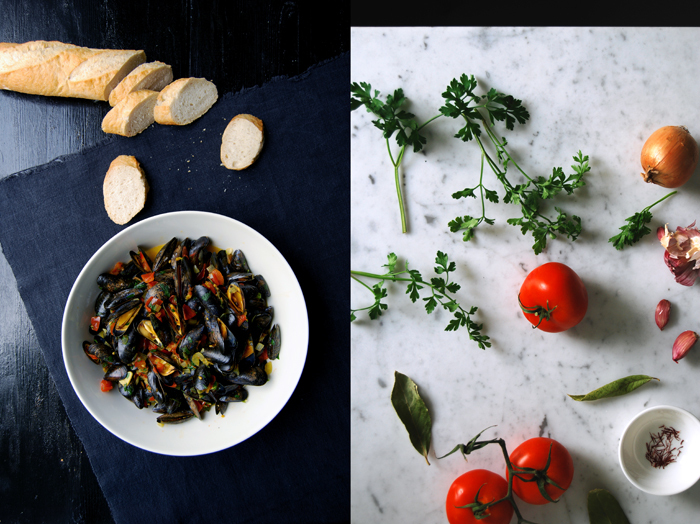 Sprinkle the mussels with parsley and serve immediately, in deep plates with a bit of broth and baguette. 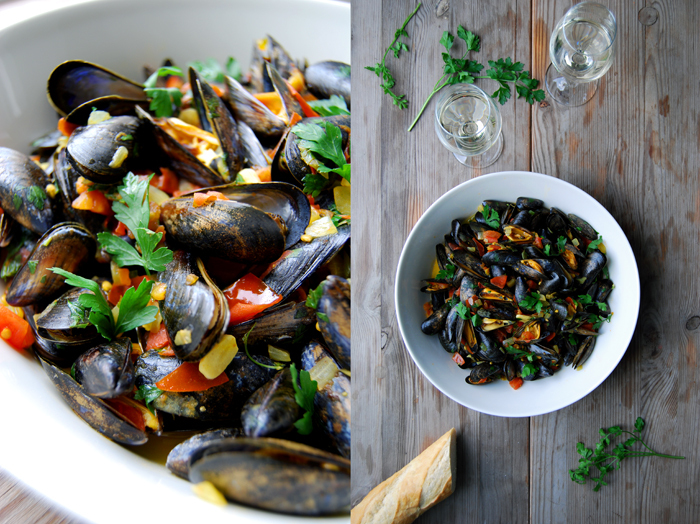 Those mussels look delicious! A nice light meal for a summer supper…yummy.